GPS watches are sports watches that have the marvels of GPS technology built into them, enabling them to accurately track speed, distance and sometimes elevation above sea level. There are many ways that speed and distance can offer an athlete significant benefits in terms of tracking and analyzing their performances. With the power of speed and distance tracking, while competing in a fun run event, an athlete can be notified as to whether their current pace is above or below the level they need to achieve their goal time. If their pace is dropping off, they are immediately notified by their watch and so given adequate notice to adjust their level of effort. The advancement of GPS technology has also allowed watches to record routes of training runs in memory, which can be retrieved and analyzed at a later date. Watches like the Garmin Forerunner, feature the ability to transfer data to a personal computer or Mac for further analysis in their software. Garmin also offer an online community portal feature known as “Garmin Connect” that allows web-based analysis and the ability to communicated with a community of like-minded people. Needless to say, when GPS came onto the scene, the sports watch community would be transformed like never before. While watches at the time had many great features, the ability to display an athlete’s actual pace while on a run or a ride, or skiing was an advancement that literally changed the way runners think about racing and training. A vital piece of equipment for someone in the running community now became their “Garmin”. Nowadays it’s almost unheard of NOT to own one. While it is true that Garmin was the company that would have the most impact on defining the world of GPS watches, other companies jumped on board the GPS train too and now almost all major watch companies offer timepieces that utilize GPS technology in the form of an external “pod” device that attaches to an athlete’s upper arm or clips into their running shorts. 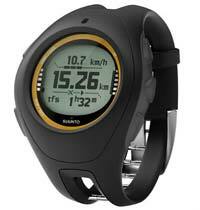 While Garmin is the main manufacturer or GPS watches that are all-in-one watches. That is they have the GPS aerial mounted within the wristwatch, Timex have just released their new Global Trainer watch, which attempts to offer some serious competition to Garmin’s Forerunner offerings. Will other watch company’s follow suit? Time will tell, but one thing’s for sure… GPS is here to stay!